I’ve made crab cakes many times in the past. I’ve made different sizes and mixed up the ingredients in small ways, but nothing really new and different in any significant way ever happened with my approach. Then, I saw Mark Bittman’s NY Times article about Thai style crab cakes, and there was a new and different twist that I simply had to try. His idea was to mimic Thai fish cakes that use pureed fish as a binder, but he used shrimp instead of fish for a better melding of flavors with crab. A few more ingredients common in Thai cuisine were added, and he had a new kind of crab cake. I had prepared a shopping list with this recipe in mind, and we stopped off at the farmers’ market before going to the grocery store. I was excited to find locally grown Thai chiles and Thai basil to use in the crab cakes. For one pound of lump crab meat, six medium, raw shrimp were pureed in a food processor. The pureed shrimp were added to a mixing bowl with a little fish sauce, one egg, some chopped green onions, cilantro leaves, a seeded and chopped Thai chile or two, minced fresh ginger, chopped Thai basil, and the crab. This was carefully mixed together while trying not to break up the crab too much. Two to three tablespoons of fresh bread crumbs were to be added, and I think I used even less than that. The shrimp and egg held the mixture together very well, and the breadcrumbs were almost unnecessary. The cakes were formed and refrigerated for 30 minutes or so and then were dredged in flour before being fried for a few minutes on each side. In the article, Bittman suggested serving the cakes with a dipping sauce of fish or soy sauce with lime juice, etc. or possibly with a mayonnaise mixed with fish sauce. I stirred together a quick sauce with mayonnaise, fish sauce, lime juice, and chopped Thai basil. These crab cakes were fantastic with a little dollop of that on top, but they were so full of flavor, they were also great all by themselves. I’m definitely hanging on to this recipe and foresee cute, little, mini versions of these cakes being served at upcoming holiday parties. Just the kind of food I love! Those crab cakes look very flavorful! Yummy! MMMMMMMM,...this is what it is all about: real flavours!! I have never made crab cakes in my life, but these little guys look so great that I need to change that. Two words = LOVE IT! Crab cakes, yes! Crab cakes with a Thai twist, oh yes please!! Wonder if crab could stand up to a nice peanut remoulade sauce? Idea! Love crab cake...more than fish cake. I make several different styles of crab cakes depending on what I'm in the mood to eat...these Thai Crab Cakes will be added to the line up--thanks! They look gorgeous Lisa! They do look like a perfect snack which you could whip up easily whenever needed. 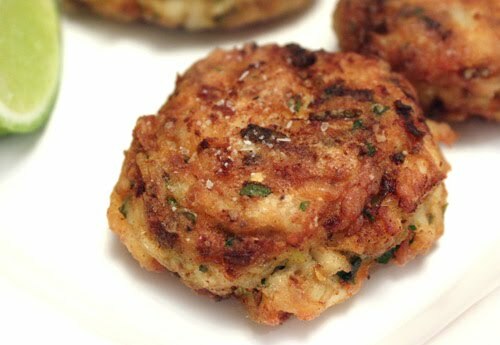 I've never made crabcakes; it's just not a dish you will find here often, but this is tempting me to try it at some point! Bookmarked the recipe! 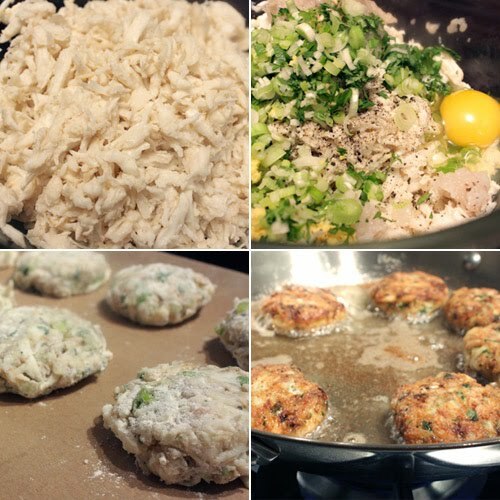 I love crab cakes but never made them. They look so good. I usually order them when I go out. Don't know why I haven't thought of adding fish sauce to mayo. oh..i can imagine how tasty these must be! will be saving this for holiday parties, just like you suggested. how perfect! I bookmarked this on Bitten's site today, glad you tried them and tested them out for me! Will be making them soon! Love crabcakes and I agree that I've been looking for a new twist myself! Thanks for sharing! 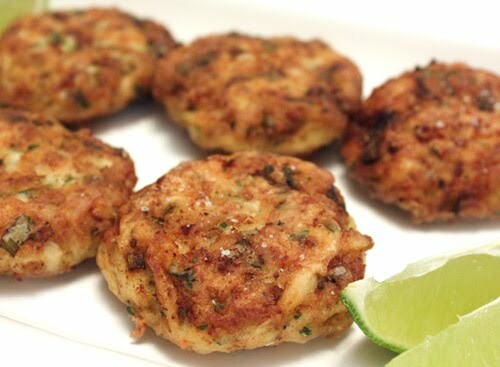 I love crab cakes...great with chili sauce. These look so delicious! Just the title alone win me over, and than that my favorite crab!!! Mmmm, yum! Crab cakes and thai food are both high on my list of favorites, so this has got to be amazing! Wow Lisa! These look soooo good! I love this type of patty. I've never made crab cakes before either but this is something I have to make at least once as they look delicious. You are so right! These will be wildly popular at holiday parties with a little dollop of Wasabi mustard on top too. I can't wait to try these, although I think hubby tends to make a better crab cake than I. Do you think you could cook them like one day ahead & still have them be as delicious after being reheated in the oven? Never had crab cakes before. But they do look so appealing, I'm writing it to my must try list. Thanks. Yay for crab cakes and I love this Thai twist - yum! These sure are full of wonderful flavors! You are so right about mini versions being perfect for holiday entertaining! I love crab cakes. These look amazing; just looking at them makes me want to eat some. All the flavors sound delicious! i think you've just stumbled upon the only way for me to consume shrimp (and crab, for that matter). these look quite tasty! pls express a dozen of these to vancouver here ASAP!!!! dying for it! Ummm, I need to make crab cakes when I return home...these sound fantastic! I know I cannot believe it is time to start thinking about holidays...argh! Awesome flavors in these crabcakes! We make a similar kind of 'cutlet' in India-just that we add some ginger+garlic paste and some mashed potatoes instead of the egg. Must try this version. I like the shrimp as a binder. I need to make crab cakes again and I love these flavors! Oh wow - love crabcakes, and these look divine! I cannot wait to give them a try. I remember this article but it got side tracked - so glad to have found it again. We just made our fist ever crab cakes tonight! These sound amazing! I'm glad you love making crab cakes, because now I have a bunch of great options for when it comes time for me to make them. Try this Thai cooking website.